The tradition of a groom removing the bride's garter with his teeth while crowds of people look on is one that is slowly dying out, but still so ingrained in our heads that when viewing this image we don't need to see any part of the bride to know that she's right there, just out of frame. 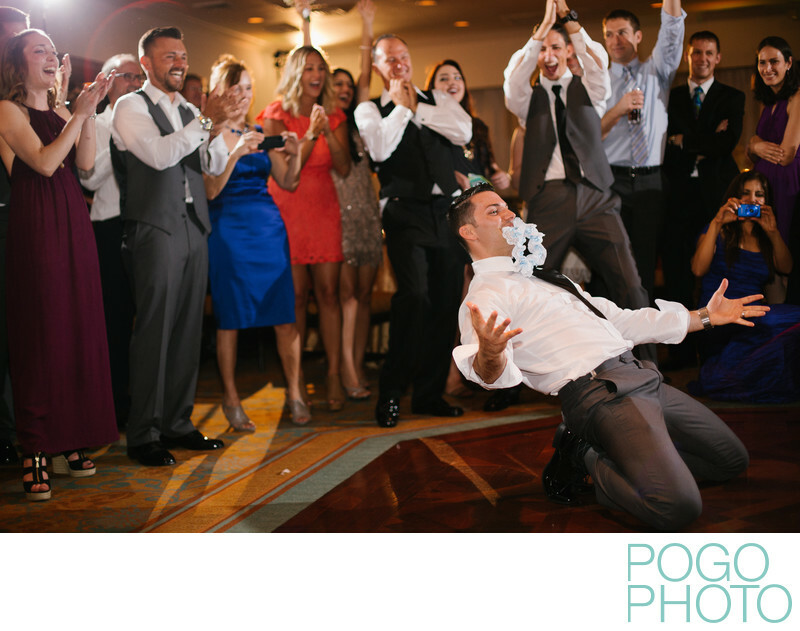 The triumphant pose and jubilant crowd behind the groom indicates that while this tradition may not be missed if it isn't followed (and the garter and bouquet toss are starting to become a little tired and old fashioned in most circles), many people still find it riotously entertaining. Telling a story within an image by omitting the most obvious part of the action is a technique documentary photographers use to draw interest from the viewer and give our minds a stumbling block and a task to decipher what's happening. The reception space at the Key Reef Club in Key Largo (at the very top of the Florida Keys) is ideal for warmer months that may run into stormy weather. Completely enclosed from the elements, this event space has a large dance floor and a multi level layout that doesn't feel as much like an event hall as many similar locations do. The lower ceilings provide some challenges for more interesting lighting techniques, but are very manageable for a more typical filled flash or bounced flash solution. Location: Ocean Reef Club, 201 Ocean Reef Drive, Key Largo, FL, 33037. 1/200; f/2.0; ISO 1000; 50.0 mm.